I've finished tabulating the final results of the Obsidian Gate worldwide event! All in all, we had pretty even representation in the event, with the Guild performing very well despite only having a single character. This is most likely a combination of Karlheinz being a sniper (snipers are cool) and a member of a readily identifiable Malifaux faction. In the end, though, the King's Empire claimed victory, much of it on the shoulders of Dr. John Watson, who was a huge hit among players and among one of the most popular characters in the event (followed by a Zesiro Selassia, Abel Negasi, Nakazawa Sadao, and Karlheinz Benewitz, all of whom were more or less tied in playtime). As a result, the King's Empire will be receiving a new adjunct in the form of Dr. John Watson! Thanks to everyone who played in the adventure! We hope that you enjoyed your games as well as a glimpse at what we've got coming up for The Other Side. Awesome. Thank you. Can we share this news with our groups? My group will be sad that The Court of Two did not get it. What exactly do the numbers mean? It was only obvious that Dr. Watson would come out on top, one merely had to examine the evidence to deduce it. Elementary. 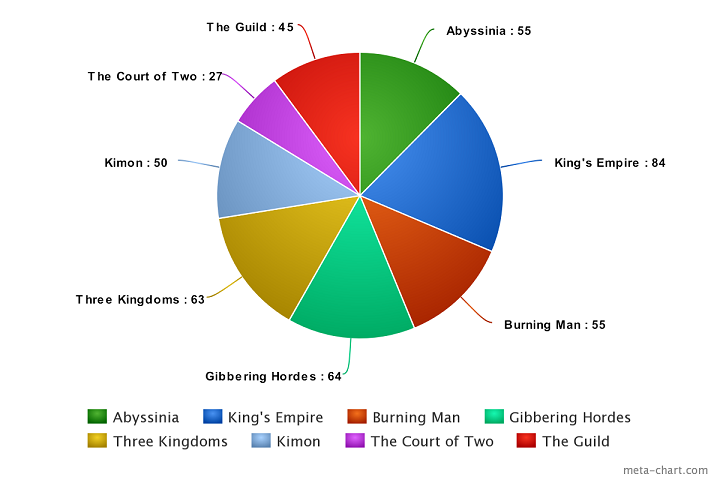 Those are number of people that played characters of that Faction or Fatemasters that voted for that Faction. And what about the "canonical" story end? Dead, sleeping or alive? So the total is 443, so if everyone reported all 4 Acts, and each table had 3-4 (3.5) players, and the FM voted each time, then only 24 tables fully reported? I'm surprised, This campaign was well written and very fun to play. I liked learning the system. Is there any way we could be given a breakdown of FM vs player submissions? Any chance there could be 2 Adjuncts released? My group were unable to get through the entire event in time, though they're still keen to progress. Needing 2 or 3 sessions, running once a fortnight, means I only got to report one act. Dr. Watson is of course one of the chosen few. Our experience exactly. You can see from the activity in this forum that there was an inevitable drop in numbers as the campaign progressed. However, as AmKhaibitu said, we may still play this campaign further. At the very least it has certainly raised TTB's profile amongst what had previously been very much a malifaux-centric group of gamers, and we will now see more TTB being played regularly in the store. That will be addressed in the appropriate Other Side expansion book. Thank you. I don't recall reading any Stitch in Time results. Have they been published? Yes, we made them public at the time. I don't believe that the forum exists anymore, but the Arcanists claimed victory. Thank you, I must have missed it. Who was the most popular character and what consequences were there for the storyline? The most popular character isn't something that has stuck in my mind, unfortunately. As for consequences, the Arcanists are gaining a boon in the story, which you'll see before too long. I'm starting Act II tonight lol. It took 2 sessions to get through Act I (we're new and there are a lot of time constraints) but we're having a great time. Most popular might have been Amanda Alonso... seems like she was in a majority of the session reports that I remember reading, anyway! Seems like I remember Darryl Fishbocker, The Amazing Chavis, and Ashley Morgan showing up fairly often, too. Could you please provide any update regarding Stitch's impact on the storyline? I suspect it has something to do with Collodi's and Jack's fate. But what about Arcanists' prize?